How to Make Sweet and Sour Chicken: Preheat oven to 325˚F. Cut chicken breasts into 1-inch pieces and season with salt and pepper. Place 1 cup cornstarch into a gallon-sized ziploc bag, add chicken and toss to coat. Heat 1/4 cup oil in a large, heavy bottom pot (I used my French oven with nice tall walls to reduce splatterage on the stove). In a shallow dish, whisk together 3 eggs. Dip the cornstarch-dredged chicken pieces into the beaten egg, coating both sides then transfer chicken to the very hot oil. Cook chicken in hot oil about 30 seconds per side or until golden. Having very hot oil is key. You don't want to cook the chicken through, but just until golden. Transfer chicken to a 9x13 baking dish and continue dipping and sautéing remaining chicken, adding more oil as necessary. Cooking tip: if you add oil to the pot, let it heat up a little before you add more chicken. In a medium bowl, stir together sauce ingredients: 1/2 cup apple cider vinegar, 4 Tbsp ketchup, 1 Tbsp soy sauce, 3/4 cup sugar and 1 tsp garlic salt. Pour sauce over your sautéed chicken pieces and toss to coat. Bake uncovered at 325˚F for 1 hour, turning the chicken twice while baking to coat with sauce. 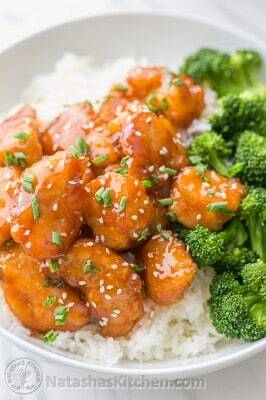 Serve warm or hot over steamy white rice, and crisp tender broccoli for a balanced meal.